Sadly the Pastor of my families Church, Rev. 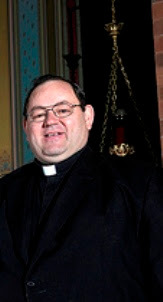 Brian Monnerat, pastor of the Church of St. Matthew in Forestville, CT died unexpectedly Wednesday, July 14 2010 while on vacation in Bermuda. Father Monnerat was on a cruise with his family and friends when he died of an apparent heart attack. He had such a big heart....We will remember him for his kindness towards all. During his homilies, he often spoke "off the cuff", sharing his heart and feelings with his parishoners. He had a heart of gold. He was our spiritual father and he often gave us the sacraments. Our kids used to love to go to him for our monthly Confession, "because he was so easy", they would say. He reflected God's mercy and kindness. Jesus said -"Blessed are the merciful: for they shall obtain mercy" (Matthew 5:7). You had such a kind, merciful heart Father Brian...May God grant you mercy in return. +Eternal rest grant unto him, O Lord, and may perpetual light shine upon him. May his soul, and the souls of all the dearly departed rest in peace. AMEN.